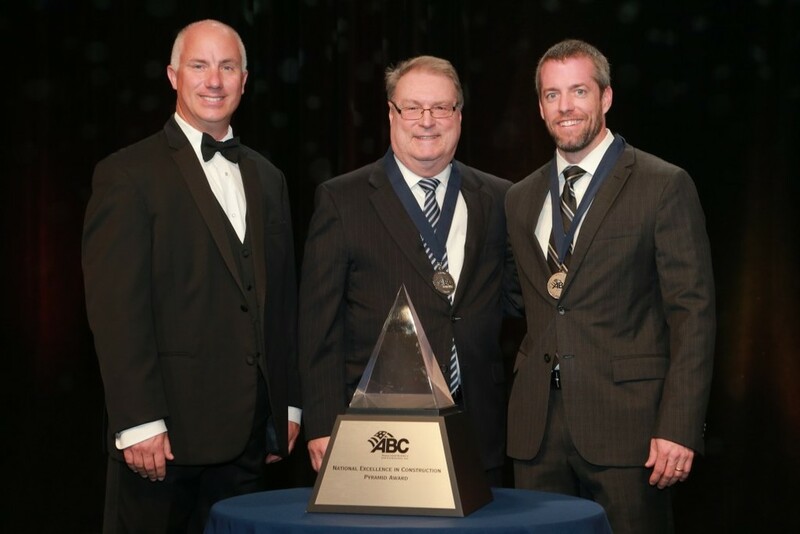 JC Richards (middle) of Strategic Real Property Advisors, LLC, the owner’s representative, and Project Executive Jamie Hart (right) accept an ABC National Excellence in Construction Pyramid Award for the United Arab Emirates Chancery project. Forrester Receives ABC National Excellence In Construction Award. Forrester Construction Company today announced that its work on the United Arab Emirates (UAE) Chancery in Washington, DC has earned the company a National Excellence in Construction (EIC) Pyramid Award from Associated Builders and Contractors (ABC) in the Historical Restoration or Renovation – Over $10 million category. Forrester’s project team and the United Arab Emirates’ representative accepted the honor March 2 during ABC’s 26th annual EIC Awards celebration in Fort Lauderdale, Florida. A construction industry top honor, this EIC award is the Forrester’s 20th received since 1998. The Embassy Row chancery is located on Massachusetts Avenue, NW in Washington, DC. To support the nation’s diplomatic mission in the United States, Forrester completed an 18,000 square foot, multi-story historic renovation and restoration of the UAE’s existing embassy and constructed an annex facility to provide additional space for administrative functions. The annex includes an underground parking garage, with auto lifts and a sky bridge to connect it to the original structure. Nicknamed the “ship-in-a-bottle” project, unusually tight site conditions and proximity to neighbors, including another embassy, required careful logistical coordination and sequencing of work. Construction involved significant structural modifications including installation of new structural steel and concrete systems, substantial sheeting, shoring, underpinning and micropiles and concrete foundations and slabs. United Arab Emirates Chancery Street View. Learn more about this project. ABC’s EIC Awards program recognizes the very best construction projects from around the nation. Projects are judged on complexity, attractiveness, technical approach, completion time, workmanship, innovation, safety and cost. A panel of industry experts served as the competition’s judges this year with representatives from the Design-Build Institute of America, Engineering News-Record, Construction Users Roundtable, the National Association of Women in Construction and among other leading organizations. Founded in 1988, Forrester Construction Company is an award-winning Engineering News Record Top 400 and Washington Business Journal Top 25 general contractor offering clients construction management, preconstruction and design build services. A locally-owned leader in the Washington DC Metropolitan market, Forrester has a proven record of construction excellence, client satisfaction and efficient project delivery. This has led to work on such landmark projects at the United States Supreme Court, Arlington National Cemetery, National Institutes of Health, Ford’s Theatre, The Kennedy Center and the Smithsonian National Zoo. Since its inception, the firm has been recognized with over 200 construction industry awards and has built many solid, ongoing relationships with its high percentage of repeat clients and long-term subcontractor partners. Associated Builders and Contractors (ABC) is a national construction industry trade association representing nearly 21,000 chapter members. Founded on the merit shop philosophy, ABC and its 70 chapters help members develop people, win work and deliver that work safely, ethically, profitably and for the betterment of the communities in which ABC and its members work. Visit at abc.org.